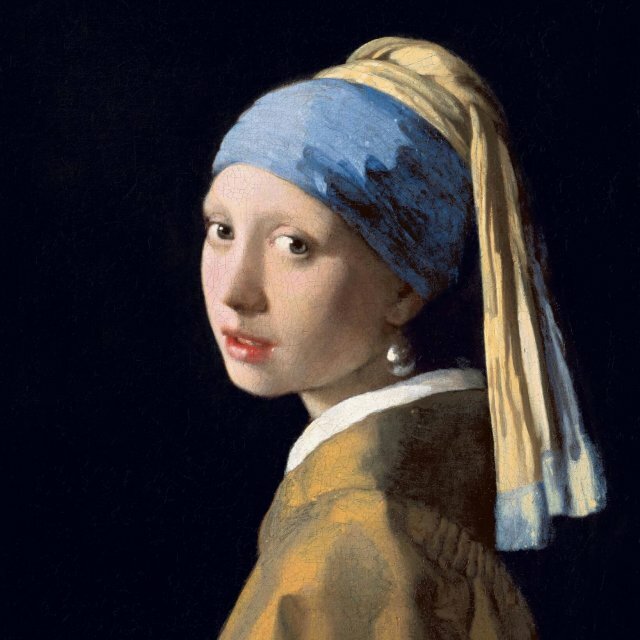 Johannes Vermeer painted a total of 37 paintings during his lifetime. 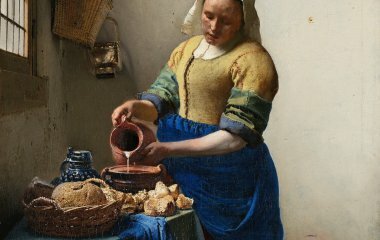 Some of his paintings are very famous, but which are the most beautiful? 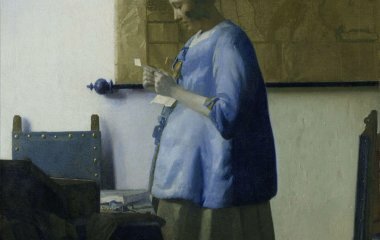 We asked the Director of the Vermeer Centrum Delft, Herman Weijers, to give us his top 5 Vermeer paintings. 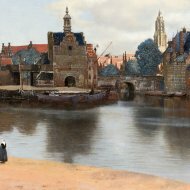 Delft at its best in the 17th century. The heavy and threatening cloudy sky (or has the rain just passed? ), the tower of the New Church in the sunlight. The old city gates that have long since gone. 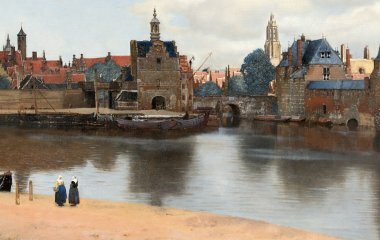 It's hardly surprisingly this cityscape is considered to be Vermeer’s most beautiful painting. When I saw this for the first time in real life in 1996 at the Vermeer exhibition in the Mauritshuis, I fell in love with her immediately. 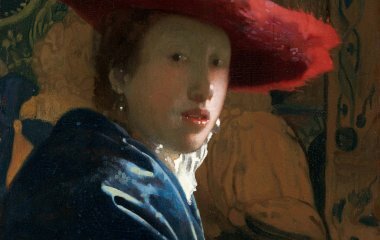 The vibrant red of the hat seems to glow and contrasts sharply with the dark blue of the clothing. Pearls in her ears, sitting on a ‘lion head chair’. One of the two smallest Vermeers painted on wood. She is mine! 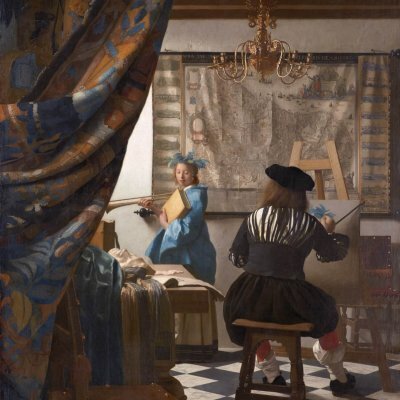 This painting – which Vermeer refused to sell – is a perfect example of his considerable skills: the perspective in the marble tiled floor, the minute detail in the painted fabrics, the twinkling of light in the chandelier, the painter seen from behind. 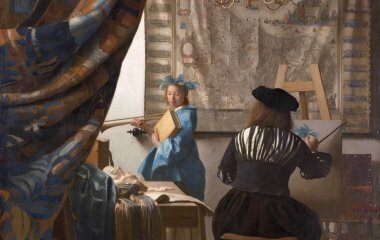 Vermeer knew what he wanted us to see and even after 350 years we still can't stop looking at it. So simple. A girl pouring out milk. Is she going to make bread pudding? She already has the bread. Is she about about to prepare a meal? We will never know. And is she even a servant? Servant girls in those days didn't usually wear such colourful jackets and such beautiful blue skirts. You see her likeness everywhere, from French cheese to little Playmobil figures. 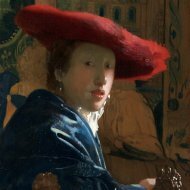 It was only when we were working on the restoration of this painting for an exhibition in the Vermeer Centrum Delft in 2012 that I realised how incredibly detailed it is. And talking to the restorers and other Vermeer experts, I realised there was so much more to it. The letter being read in silence, the light coming from the left, the reflected light within the light, the beautiful blue colour of the jacket, and so on. 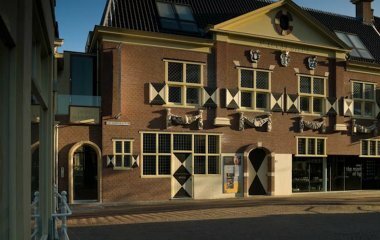 In the Vermeer Center Delft you will learn everything about the life of, in Delft born and raised, painter Johannes Vermeer. 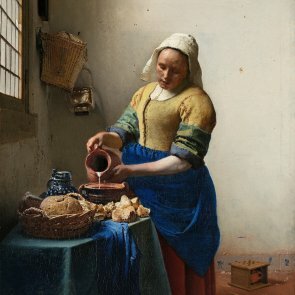 In the Vermeer Centre all paintings are exhibited (replica's), you will also get to know what techniques Vermeer used and how his paintings are produced.